Abbot Philip Lawrence, OSB, placed the letters he received from his monastic association’s East/West Dialogue group “carefully in the garbage can” – he wanted his monastery, Christ in the Desert, to ”focus on the inner reality of Catholic Christian monasticism.” In 2002, however, two Bön monks from Menri Monastery India, arrived on his doorstep. They had been unhappily placed elsewhere. A relationship began and now the two monasteries consider themselves ”twin monasteries.” Jaffa Elias explores this connection with Abbot Philip Lawrence and Chongtul Rinpoche, a Menri-educated tulku. Abbot Philip Lawrence, fifty-eight and jovial with it, gives an energetic tour of his monastery, which is picturesquely set in a circular valley amidst towering cliffs. He points to a wall in his cell. It is blue and adorned with a thangka, photos, and various memorabilia – “this is my Bön wall,” he laughs. 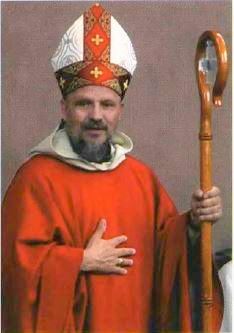 Before his family became Catholic, Philip Lawrence, aged 10, had “never heard of religious life.” Three years later, however, he took an exam to enter the seminary at Mount Angel Abbey, Oregon. “It was the first time I’d ever seen a monastery, the first time I’d ever heard of a monk, and the minute I saw it, it was what I wanted to do.” He joined the seminary at 14. Aged 20 he became a monk and took temporary and final vows, and was ordained a deacon. Aged 30 his spiritual director sent him to Christ in the Desert, New Mexico. He was made the superior of the community, with the title of Prior in 1976. There are now 31 monks. Chongtul Rinpoche takes a break from an intense international teaching tour, to spend a couple of days at Christ in the Desert. He is young (35), affable, and relates directly. Rinpoche was born in Himachel Pradesh, northern India, in 1967, and joined Menri Monastery, in the Bön settlement of Dolanji, aged eleven, taking monks’ vows at thirteen. 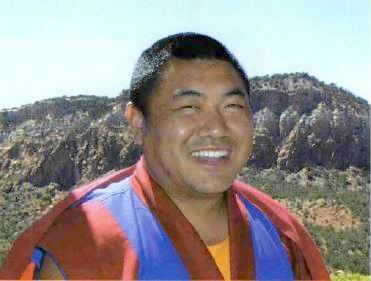 He graduated as a geshe in 1990 after a nine-year course at the Bön Dialectic School. He has served Menri in many capacities, first as ritual performer in the protector chapel (he was eleven); then as chant leader (he was fourteen). He now takes care of the monastery under abbot Menri Trizin Rinpoche’s direction, teaches in the Bön Dialectic School and directs the Bön Children’s Welfare Center, which cares for 400 orphans and children from poor families. “I really like being a monk. It is a very nice life,” Chongtul Rinpoche laughs. At fifteen he was recognized as the reincarnation of the head lama of Kyong Tsang Monastery, Eastern Tibet. He was able to visit there in 1997. Scanning the monastery’s books he picked one out that seemed familiar and was told that it was his previous incarnation’s daily prayer book. You strove to finish that book every day despite sometimes arriving home after midnight, he was told by the monks there.